Cumbernauld Colts’s first taste of the Irn-Bru Challenge Cup ended in disappointment when they went down 3-0 to Hamilton Academicals under-20s on Wednesday. The tie, at Broadwood, was reward for Colts exceeding expectations by finishing fourth last season in their debut Lowland League campaign. Accies, who finished second in the development league behind Celtic last season, were always likely be a tough test for the Broadwood side. And the visitors were in front within 10 minutes, Ross Cunningham allowed space on the edge of the Colts area to control a ball dropping from the sky and find the corner beyond the reach of Chris Fahey. It was a case of lesson not learned for the home defence as the same player had cut inside and fired narrowly wide only moments previously. Stephen O’Neill nearly pulled the home side level with a low left foot effort well stopped by Alex Marshall in the Accies goal, but that was the only effort on target to trouble the youngsters in the opening 45 minutes. For the second half Owen Ronald replaced Conor McKenzie on the right, but the wide man hadn’t touched the ball - no-one in a Colts jersey had - before they found themselves 2-0 down with more calamitous defending. A ball forward was missed by the Colts central defence and was pulled back for Steven Boyd to drill low into the net from 12 yards. On the hour Sean Brown replaced Andy Hunter and the young striker, still working his way back after a year out of the game through illness, at least caused the Accies defence some discomfort with his direct, physical and at times awkward style. But having spent so long out though the sharpness that saw him score goals for fun still isn’t quite there. His rebound from a Richard Kirwan header hit the bar before he narrowly missed connecting with an O’Neill corner. An unfortunate slip then stopped him turning in from the rebound as O’Neill forced a save from the keeper. On a positive note Colts were at least creating chances but in truth they probably should have been more than two behind, Hamilton passing up three excellent opportunities, including an open goal and one cleared of the line by Mark Batchelor. However more slackness from the home side finished the game six minutes from time when Ryan Tierney beat Fahey with a low effort. It was a hugely disappointing day for Colts, who now head to Dalbeattie on Saturday trying to kick-start their season in what will be a very tough game against a side expected to challenge at the top end of the league. Meanwhile Clyde also bowed out of the Irn-Bru Challenge Cup at the first hurdle when they went down 5-0 at Partick Thistle’s under-20 development side, also at Broadwood, on Tuesday. 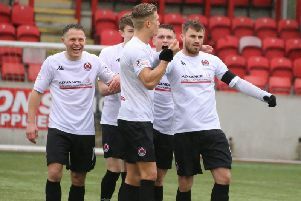 Clyde boss Barry Ferguson left out a number of regulars with Saturday’s league opener against Montrose in mind but his young side still went in at the break on level terms after a goalless first period. However Kevin Nisbet put the young Jags side in front seven minutes into the second half and James Penrice added a second 12 minutes later. Nisbet made it 3-0 on 67 minutes and then completed his hat-trick eight minutes later before Neil McLaughlin rounded off the scoring 10 minutes from time.